BLOWING SNOW: None at location. Gusty over exposed terrain. Very little wind impacts below/near treeline. Above treeline poor visibility limited observations/access. Snow started to fall at 2300 on the evening of the 26th and did not stop for 14 hours. New snow totals of 10-12 inches was observed at Bunny Flat and in the Old Ski Bowl. On the west side, Castle Lake and Eddies, about half that was recorded by weather stations. Snowmobile grooming operations out on the east side, Medicine Lake area, observed upwards of 2 feet of new snow! These snow totals typified the storm...very localized, showery conditions with periods of heavy snow, isolated to specific areas. One minute hosted partial clearing with blue sky donut holes, the next a complete whiteout and snowing. A late afternoon tour on the south side of the big hill did not show any glaring instabilities, however visibility was tough. Our wind forecast completely duped us. 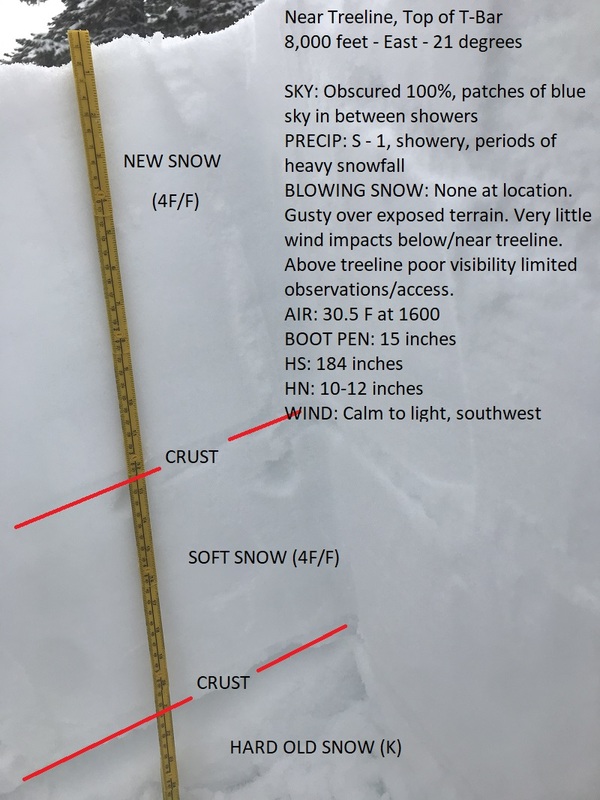 While Gray Butte recorded 14 mi/hr average speeds with gusts to 37 mi/hr ranging from S/SW to W/NW, on the snow observations revealed little in wind effect. Uncertainty exists higher on the mountain where conditions could be different in terrain exposed to wind. Snowpit tests were inconclusive below and near treeline. Small tests slopes were unreactive. Snow surfaces were smooth and soft with poor slab properties. An unconfirmed wind slab avalanche near the top of Sun Bowl was thought to have been observed (poor visibility).